With iron grips, they held their ships at sea. Face to the wind, back to the mist, they cut the water in their dragon prow ships, bringing the song of death and plunder upon the backs of gods that rose from the maelstrom of eternity. With axe and sword, shield and spear, they rose as if from the ether and opened the world to a storm of primeval lust. The Codex Nordica plunges into their world, exploring the myths and cultures of the Vikings, from Odin's Ravens to the Jotun fortress of Gymirsheim. Brian Young explores the Nine Worlds of the northmen, the legends and myths, the magical creatures, gods, heroes, giants and monsters that peopled them. All this is presented as a backdrop to the game you are already playing. 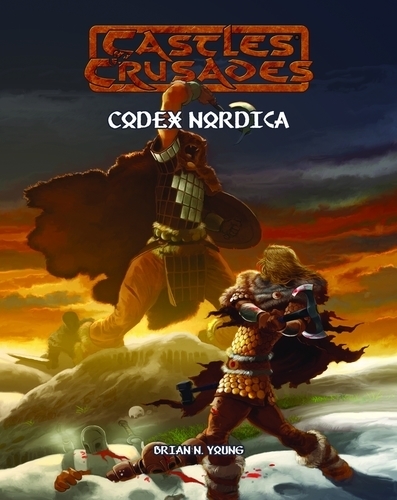 Expanding upon the core Castles & Crusades material Codex Nordica brings a host of new wizardry and enchantments, gods for the characters, warriors and battle craft. Added on to all this, are new materials for the Castle Keeper, all designed to enhance rather than hinder play. Codex Nordica brings the Viking myths to life at the table!